An ordinance in one New Hampshire town is keeping a 3-year-old girl with special needs from playing in the water at the public beach and now her mom is fighting for change. A town ordinance in one New Hampshire town is keeping a 3-year-old girl with special needs from playing in the water at the public beach and now her mom is fighting for change. Lila was born with cerebral palsy. Her mom Melissa DeLeon says being in the water is the best kind of therapy. “She’s able to splash and play like a regular kid,” DeLeon said. 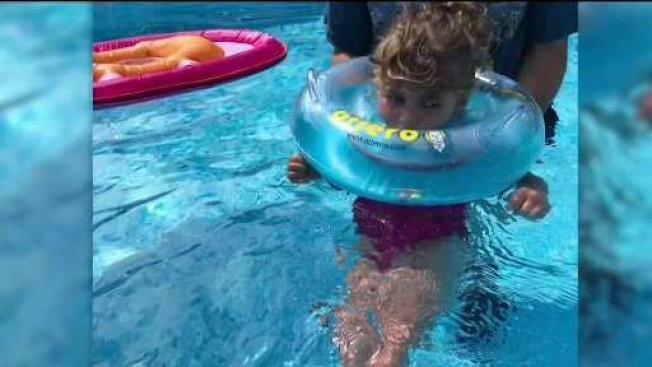 So when her family went to Leavitt Beach in Meredith they brought Lila’s special neck float that keeps her head above water. The ordinance is clearly stated and the lifeguard enforced it. But other families at the beach Friday think there should be accommodations for children like Lila. “I think you have to make special exceptions for kids and adults that need them,” said Alex Pinnell. “Yes, so they can go swimming and have fun here and not have to leave,” said his 12-year-old daughter Olivia. DeLeon agrees and wrote a letter to the local paper. Now the town is reexamining their rules. “So we can make the best decision to accommodate disabled people but at same time not compromise safety,” said Chairman of the Meredith Select Board Ray Moritz. Deleon says her daughter’s daily routine is challenging enough. And she doesn’t think a town ordinance should stand in the way of Lila’s escape to the beach. Lila might have to wait until next summer to splash around in the water here. Town leaders tell NBC Boston it’s so late in the season, any changes to the ordinance likely won’t happen before the beaches close.